Yale engineers have demonstrated a micro fuel cell made of glass. Engineers at Yale University have developed a new breed of micro fuel cell that could serve as a long-lasting, low-cost, and eco-friendly power source for portable electronic devices, such as tablet computers, smart phones, and remote sensors. The researchers describe the novel device in a paper published online in the journal Small. An alternative to a battery, a fuel cell is an electrochemical device that combines hydrogen and oxygen to produce energy, giving off only water and heat as byproducts. But the materials and methods commonly used for making micro fuel cells are fragile, inefficient, and expensive. Major components of the new device are made of bulk metallic glasses (BMGs) — extremely pliable metal alloys that nonetheless are more durable than the metals typically used in micro fuel cells. BMGs can be finely shaped and molded using a comparatively efficient and inexpensive fabrication process akin to processes used in shaping plastics. “These amorphous metal alloys are amazing materials that can be easily shaped into both large and small nanostructures, yet retain suitable properties for a wide range of electrochemical applications,” said André D. Taylor, an assistant professor of chemical and environmental engineering at Yale School of Engineering & Applied Science and a principal investigator of the research. Ryan C. Sekol, a doctoral student in Taylor’s lab, is lead author. Silicon and stainless steel are the materials typically used in micro fuel cells. But silicon is brittle and a poor electricity conductor, and stainless steel is prone to corrosion. This means they require special coatings, which drives up production costs. 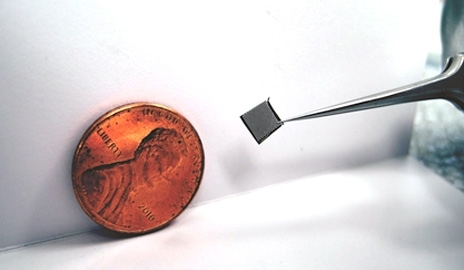 Fabricating metal components on the nanoscale is complex and time-consuming also. Using bulk metallic glasses solves these problems, the researchers said. BMGs are metal alloys with randomly arranged atoms rather than the orderly, crystalline makeup of ordinary metals. The random atomic arrangement results in a tough but elastic substance — as strong as steel, yet malleable and good at conducting electricity, and thus superior to silicon and steel for micro fuel cells. “Using thermoplastic processing, a process we invented at Yale, we can form metallic glasses like plastics, dramatically reducing fabrication costs,” said Jan Schroers, a professor of mechanical engineering and materials science at Yale and also a principal investigator of the project. He has pioneered the technique and used it to create complex shapes, including seamless metallic bottles, watchcases, miniature resonators, and biomedical implants. The BMG components of the Yale team’s micro fuel cell (the entirety of which measures three cubic centimeters) are based on zirconium and platinum compounds. The team demonstrated that its fuel cell generates power and is now working to increase it. Other authors are Forrest Gittleson, Nathan Hardesty-Dyck, and Sundeep Mukherjee of Yale; Golden Kumar of Texas Tech University; and Marcelo Carmo of the Institute of Energy and Climate Research (Germany). Yale’s Center for Research on Interface Structures and Phenomena and the National Science Foundation provided support for the research.